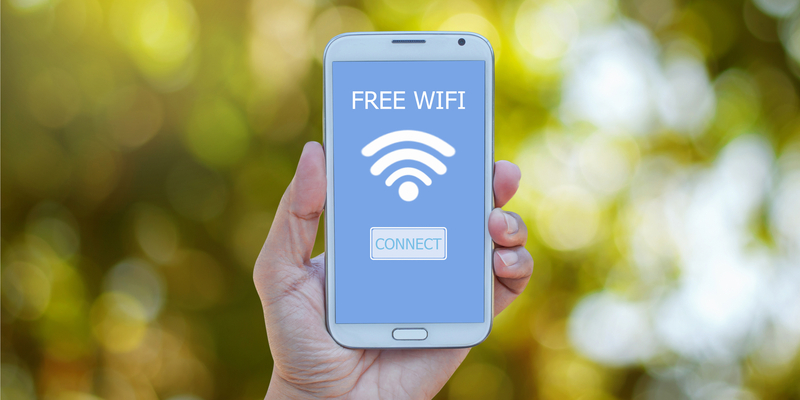 WiFi certainly doesn’t come cheap, but in a pinch, there are quite a few ways to find free WiFi, no matter where you are. You can use WiFi Hotspot Finders and arm yourself with information before you set out for the day to find free WiFi. Remember, there are always security issues with public WiFi, which can leave you susceptible to hackers. Karl teaches you how to protect your personal information while enjoying free WiFi connectivity. It’s also worth keeping in mind that you get what you pay for. In many instances, free WiFi can be slow and frustrating. 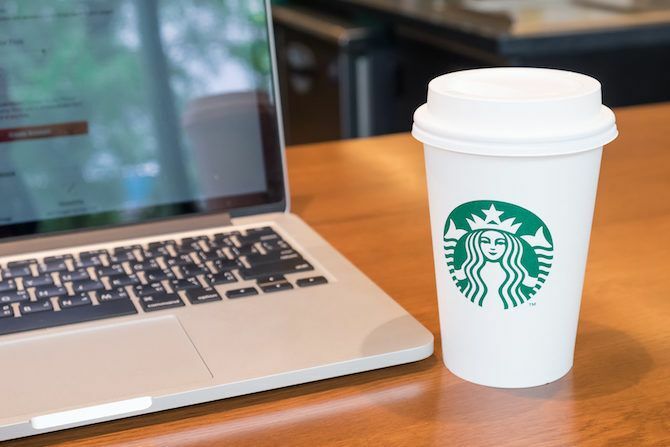 Some hotels also offer free WiFi if you join their loyalty or rewards programs—just don’t expect blazing speeds through these networks. Kimpton Hotels and Omni Hotels, for example, offer free WiFi through a free loyalty program. You can check out this list of hotels that offer free WiFi and how to get it. There are also quite a few random places you might not think to look for WiFi including laundromats, courthouses, museums, bookstores, and gyms. The hotspot finders listed below are a great way to find more of these locations. 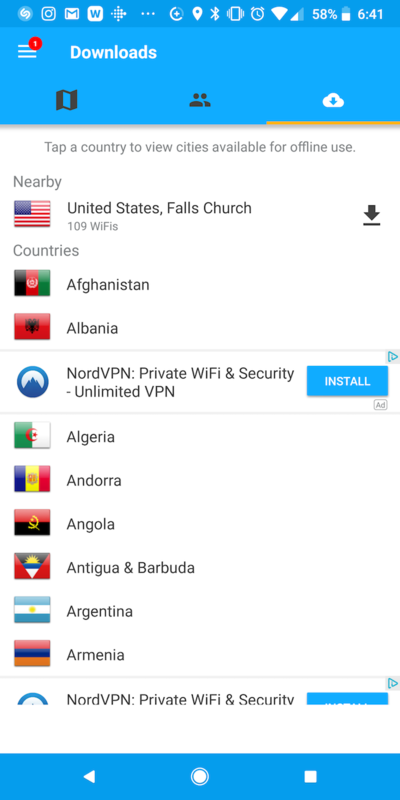 The global database includes free WiFi locations in the United States, Europe, Australia, Canada, South and Central America, the Middle East, Africa, and Asia. Locations are divided by country, state, and city, and includes libraries, hotels, restaurants, and even modes of transportation. The database includes addresses of the locations and links to their websites. If you want to take the database on the go with you, there are some great mobile apps worth considering. WiFi Map, available as a free iOS and Android app, boasts over 100 million hotspots in America, Europe, Asia, Australia, the Middle East, and Africa. The app also includes user-provided passwords for networks that are password protected and will let you know how far that WiFi hotspot is from your current location. (To view these passwords, you will have to put up with some advertising.) With the free version, you can view nearby hotspots within a 2.5 mile radius of your current location on a list. You can also look at hotspots elsewhere by panning and zooming on the map. If you register for an account using the app, you will also get access to offline maps, which will definitely come in handy when traveling so you can avoid exorbitant roaming charges. If you’re looking for even more options, check out WeFiPro, also available for iOS and Android users. 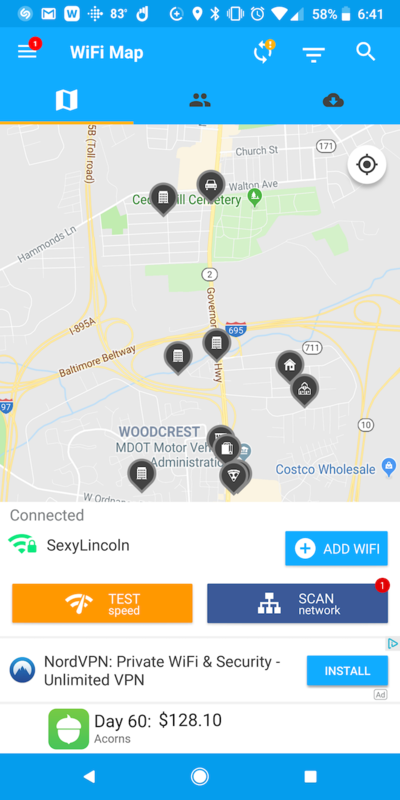 In addition a database of crowdsourced free WiFi information, the app automatically connects to what it considers the fastest network based on your location. Airport WiFi is often either password protected or, if free, it’s notoriously bad. Still, when you’re stuck in an airport with a long layover, any WiFi is better than no WiFi. If you want to access the password-protected networks often associated with airport lounges, there are a few ways to find out that information. 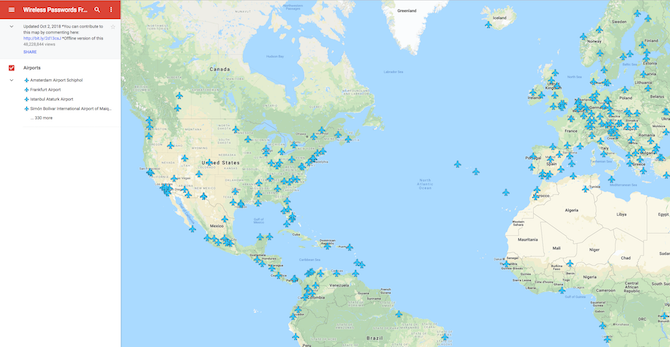 Available as a paid app, or for free through the website, WiFox is a crowdsourced and regularly updated map of wireless passwords for airport lounges around the world. It’s easy to filter down to the airport of your choice to see all passwords listed. The advantage to using the paid app is that you get offline access to saved maps, which will obviously come in handy when you’re traveling. When traveling, it’s also worth thinking about which airlines offer free WiFi onboard, because it just might not worth paying for. JetBlue offers free WiFi to all travelers, while airlines like Southwest and Alaska Airlines offer free in-flight messaging using apps like iMessage and WhatsApp. When you know which airline you’ll be flying, do your research ahead of time and find out if they offer any free options. T-Mobile customers can also take advantage of an offer that gets them one hour of free in-flight WiFi. Municipal Internet Access, or Muni WiFi, seems to be an on-again-off-again project for most communities. County residents can sign up for a free account and access the internet for little to no cost—a service covered using taxpayer money. Municipalities also often provide totally free, unlimited internet access at locations such as municipal offices, libraries, and some schools. To find out more about what your community offers, take a look at your local government websites. Free wireless access is a staple of most large libraries, and often no username or password is required. In some cases, you can also use public computers in these libraries. New York provides a service for families that can’t afford ISP charges. Families with at least one child attending a public school who don’t have at-home internet can apply for free WiFi service at home provided through The New York Public Library’s Library HotSpot program. New York also offers free WiFi on select subway stations. Another place to check for free internet access is through your ISP. Many of them offer free hotspots, many of which you will find concentrated around major cities. 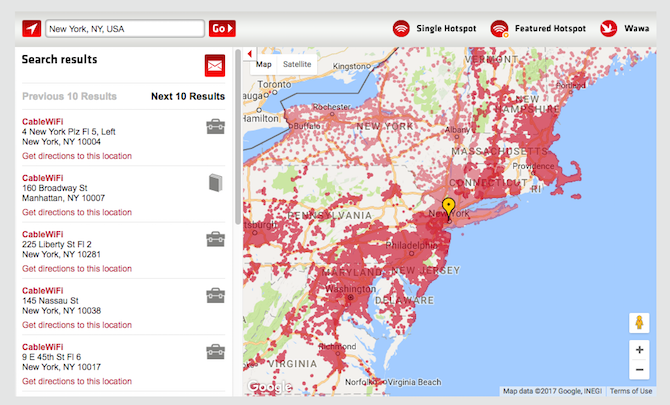 Use your zip code to find out where to find hotspots from Xfinity, Cox, Time Warner Cable, Verizon, and Optimum, among others. As an absolute last resort, you could give All Free ISP a try. The searchable database covers the United States and Canada, making it easy to find a service provider near you. The catch is that most of the services that are completely free are offering dial-up Internet—which if you’ve ever used it—you know it’s going to be painfully slow. In addition, many of the providers, like Juno for example, will display large banner ads for the privilege of using their service. And of course, if you don’t have a landline, this site really isn’t for you. 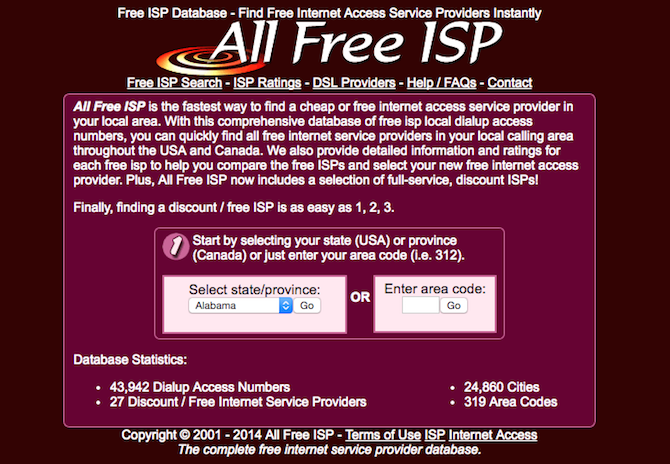 Depending on where you live in the US or Canada, you simply might not find free dial-up service. It all depends on what constitutes a long distance phone call for you. To find out if you can get free dial-up in your area, you can either select your state or province from a drop-down menu or enter your telephone area code. All Free ISP breaks the list down into cities, includes a rating system, and lets you know what platforms are supported. If you can’t find any free WiFi in your area, you can use your cell phone to create your own private hotspot. You will obviously need to take certain things into consideration including your own data limits. If you have unlimited data, some mobile networks can throttle your speed to limit your hotspot use when you tether your phone to your computer.